Spiti Valley in Himachal Pradesh has a culture centered around its ancient Lamaist Buddhist monasteries. Mane, Dhankar, Tabo, Gungri, Mud, Lidang, Rangrik, Losar and Hikkim have the best of them. The most important of them is the Key Monastery, a centuries-old Tibetan Buddhist shrine, in Lahaul and Spiti district. It is located on top of a hill at an altitude of 4,166 metres above sea level, close to the Spiti River. The largest monastery in Spiti, it is the abode of Lochen Tulku, the 24th Lotsawa Rimpoche (reincarnation of Rinchen Zangpo, the great translator). A reincarnate spiritual institution for Lamas, Key Monastery is considered to be a very old seat of Buddhist learning. It reportedly had 100 monks in 1855. 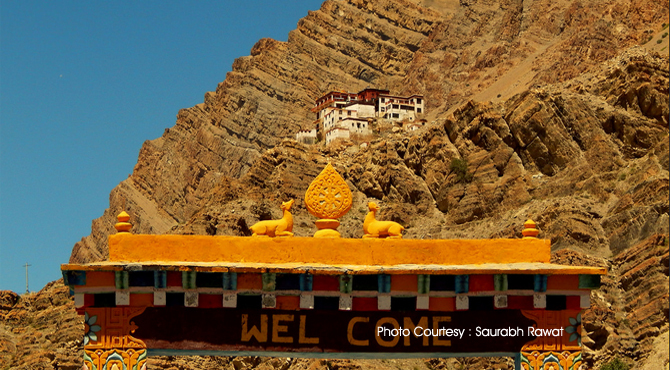 The monasteries in Spiti represent three different sects of Lamaism. Key belongs to the Go-Ing-Pa sect. Key monastery has extensive buildings on high ground, away from the villages. In the centre are the public room, temples, refectories and store rooms. Around them are clustered the separate cells in which the monks live. In the store rooms are kept, besides public property, the dresses, weapons and masks, drums, cymbals, robes and hair dresses used by monks in religious plays, dances and other ceremonies. The monastery was probably built early in the eleventh century. The monastery has been attacked many times by Mongol and other armies and was also ravaged by earthquakes. During the Dogra invasion of 1834, the monastery suffered heavily from fire. The movables were saved by the timely flight of the monks who carried them to the interior hills. The three-storeyed structure looks like a fort, with temples built on top of one another. The walls of the monastery are covered with paintings and murals. An outstanding example of the 14th century monastic architecture, the upper buildings, house five gompas and a large kitchen beside other rooms. At the ground floor, consists of storage rooms and a beautifully decorated assembly hall and cells, while the middle floor houses the dukhang which contains wall paintings. The gompas are the focal points of the monastery. Each of them is dominated by a statue of the Buddha and idols in the position of Dhyana. On either side of the statue, there are rows of wooden pigeon holes where Tibetan scriptures and commentaries are kept. Walls and books are half covered by Thanka (scroll paintings). These paintings are the oldest and the most beautiful of all Key's relic. These thankas, saved from the devastating raids of the Dogras and the Sikhs in the 19th century. In the central hall, there are 2 stucco idols, one of Yum-Chenmo (goddess Thara) and the other of Shyan rasgzeings (Avalokiteshvara). There are several other statues in the library opposite the temple.